This chapter focuses on the Logic Games section (formally known as the Analytical Reasoning section). The cases in this chapter will teach you a six-step approach you can use to work every game you encounter. The Logic Games section can seem daunting at first, so we’ll break it down into parts. As noted in Chapter 1, the Logic Games section requires you to perform only two tasks: ordering and grouping. The test writers use some combination of those two tasks to create four different types of games. We’ll also discuss the best strategy for tackling the Logic Games section as a whole. Accordingly, this chapter contains six cases. Four of them—Case 1, Case 3, Case 4, and Case 5—introduce a particular type of game. Those four cases include a sample game and a detailed explanation of how to work the sample game. Case 2 introduces you to conditional statements, which are a particularly important type of clue and can appear on any type of game. Finally, Case 6 discusses section-wide strategy. As you’ll soon see firsthand, an effective Logic Games strategy involves a good bit of writing: you’ll draw a diagram, symbolize clues, and map out your answers to each question. Unfortunately, you’re not allowed to bring scratch paper into the LSAT. You have to do all your work in the blank space in your test booklet. As you practice, get in the habit of working in the small space you’ll have available to you. The sample games used in these cases are not representative of the average difficulty of the games you’ll see on test day. The games are teaching tools; they are designed to demonstrate the fundamentals of a sound approach to working games. Each case concludes with setup drills that reflect the difficulty of real games. Practicing is the only way to truly get a sense of how hard logic games really are. The Logic Games sections in the practice tests included at the back of this book contain a mix of games that is representative of what you’re likely to encounter on the actual LSAT. Because you’ll use this same six-step approach on every game you encounter, this case is the longest case of this chapter. As you work different kinds of games and more difficult games, you’ll want to return to this case to review the fundamentals. Second, this case introduces you to a particular type of logic game: one-tiered ordering games. One-tiered ordering games have been by far the most common type of game on recent LSATs. As noted in Chapter 1, the LSAC has released to the public 15 of the 20 LSATs that it administered between 2006 and 2010. Of the 60 games that appear on those LSATs, 24—or 40 percent—were one-tiered ordering games. That’s an average of just under two per test. Mastering one-tiered ordering games is therefore an indispensable component of success on test day. We’ll introduce ordering games using a sample game, which we’ll walk through together step by step. If you want to take a shot at working it on your own beforehand, feel free. You might find the explanation of how to set up and work the game easier to understand if you’ve spent some time trying to work it yourself. But you don’t need to do so; after all, the purpose of this chapter is to introduce you to a new, more effective method of solving logic games. She walks the Labrador some time before the Terrier. She walks the Poodle immediately after the Mutt. She walks the Retriever either immediately before or immediately after the Terrier. She walks the Schnauzer fourth. 1. Which of the following could be the order, from first to last, in which Emily walks the dogs? 2. Which of the following must be false? (A) Emily walks the Terrier second. (B) Emily walks the Labrador third. (C) Emily walks the Mutt third. (D) Emily walks the Retriever sixth. (E) Emily walks the Poodle sixth. 3. If Emily walks the Retriever third, which of the following must be true? (A) Emily walks the Terrier fourth. (B) Emily walks the Poodle sixth. (C) Emily walks the Poodle fifth. (D) Emily walks the Labrador second. (E) Emily walks the Mutt first. 4. Which of the following must be false? (A) Emily walks the Mutt first. (B) Emily walks the Labrador second. (C) Emily walks the Terrier fifth. (D) Emily walks the Labrador first. (E) Emily walks the Retriever third. 5. Which one of the following is a complete and accurate list of the positions in which Emily could walk the Retriever? 6. If Emily walks the Mutt second, which of the following could be false? (A) She walks the Labrador before she walks the Mutt. (B) She walks the Terrier after she walks the Schnauzer. (C) She walks the Retriever after she walks the Terrier. (D) She walks the Schnauzer before she walks the Retriever. (E) She walks the Poodle after she walks the Labrador. To determine what kind of game you’re dealing with, look to language in the setup and language in the clues. It’s important that you read both the setup and the clues before you begin your diagram. Sometimes the information you need appears in the clues and sometimes there are clues in the setup. Because you’re being asked to arrange the elements (the dogs) in sequential order (which one was walked first, second, etc., down to sixth), this is an ordering game. Because you’re assigning exactly one element to each slot in the game, this is a one-tiered ordering game (we’ll discuss a different kind of ordering game—two-tiered ordering games—in Case 4). Five basketball players are ranked by height from tallest to shortest. There are no ties. The new children’s book series has exactly eight chapters. A real-estate agent must show seven houses. She does not show any of the houses more than once, and no two houses are shown at the same time. When you see “exactly once” and “one at a time” language in the setup and comparative language in the clues, you’re dealing with an ordering game. Next, you’ll symbolize the game’s elements and each of the clues. First, abbreviate each element using a letter. Then list the letters off to the side of the diagram so you can keep track of them as you work. Symbolize the clues in a vertical line off to the side of your diagram. Keep the space underneath your diagram clear because you’ll need to expand the diagram as you work the questions. The same principle that determined how you drew your diagram will now dictate how you symbolize each clue: What does it look like? Then check off “L” and “T” on your list of elements. It’s important to get in the habit of doing this as you work. Once you’ve symbolized all the clues, if one of the elements is not checked off, you know it is a “free agent”; there are no restrictions on where it can go. This can be a powerful aid in working a game. Here, you know exactly how far apart these two elements have to be: wherever they are plugged into the diagram, M will immediately precede P. What will that look like? and in either case the clue would be satisfied. Instead of using two separate boxes, you’ll use one and make a notation that indicates that the elements in the box can appear in either order. Whenever possible, symbolize a clue directly into your diagram. The single most costly mistake you can make on the Logic Games section is to incorrectly symbolize a clue. You can easily wind up working through most of the questions before realizing your mistake. You can’t afford to lose that time. It is absolutely vital that you double-check your symbolizations before proceeding any further. Double-check by translating your symbolizations, not by re-symbolizing the clues. Translated into English, that says, “Emily walks L before she walks T.” After making that translation, compare it to the language of the clue. Since your translation matches the language of the clue, you know you’ve symbolized that clue correctly. You’ll repeat this process for every clue before beginning to Make deductions. It’s better to double-check this way than by re-symbolizing each clue. Why? If you misunderstood the clue the first time you read it, you’re likely to make the same mistake the second time and you’ll end up with the wrong symbolization again. Plus, when you translate your symbolization into English, the double-checking process is as simple as comparing your translation to the clue. If the two don’t match, you’ll spot it right away. The final step before you begin working the questions is to investigate the clues to see if you can make any deductions about the placement of the elements in the game. It can be tempting to skip this step and dive straight into the questions—making deductions takes time, and time is of the essence. But these deductions will drastically reduce the time it takes you to answer the questions. Many LSAT students initially find the process of making deductions to be a mysterious one. Fortunately, there are a few categories of deductions that show up repeatedly on the Logic Games section. And there is a consistent set of steps you can follow that will allow you to make those deductions. The first deduction is relevant to those “before or after” clues. Think about it this way. If someone must stand in line after you, you can’t be the last in line. And if someone must come before you, you can’t be first. You can deduce from this clue that Emily cannot walk T first. If she did, it would be impossible for her to satisfy the condition that she walk L before she walks T. For similar reasons, you can deduce that she cannot walk L sixth. If someone must come after you, you can’t be last. If someone must come before you, you can’t be first. The third clue will not support this kind of deduction, as Emily can walk R and T in any order so long as she walks them consecutively. 1. Identify any element that appears in more than one clue. 2. See if you can combine those clues to produce new information. Identify any element that appears in more than one clue and attempt to combine those clues. In this game, the only element that shows up in more than one clue is T, which appears in both the first (L — T) and third clues. And it’s possible to combine those clues to produce new information. In plain English, the third clue tells you that R and T appear consecutively. 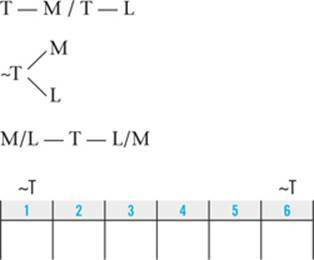 As a consequence, it’s impossible for L to appear in between R and T. Since R and T are right next to each other and the first clue tells you that L must come before T, it follows that L also must come before R.
This deduction functions as a new clue, which means you can make deductions based on it. This new clue will support two can’t-be-first-or-last deductions. Take a moment to see if you can make them. Deductions are like clues: you can make deductions based on your deductions. Next up, look for what we’ll call down-to-two deductions. In the Logic Games section, being able to limit a slot to only two elements is almost as valuable as being able to definitively place one element in that slot. While it’s rare to be able to definitively place an element, you’ll frequently be able to make a down-to-two deduction that limits a slot to two possibilities. No other down-to-two deductions are available, so let’s turn to the final type of deduction, which is to look for possibilities of block-splitting. Block-splitting is one of the most commonly recurring concepts on the Logic Games section, showing up in all four types of games. The test writers frequently use it to generate correct and incorrect answers. What is block-splitting? In this game, clues 2 and 3 require M and P and R and T to always appear right next to each other. Those clues create two-element “blocks.” The basic concept of block-splitting is that in a game that involves blocks of elements, you can’t place the nonblocked, single elements in a way that makes it impossible to place all of the blocks. Here’s a simple example. Suppose Emily only had to walk three dogs—S, R, and T—but she still had to walk R and T consecutively. If Emily walked S second, there would be no way for her to legally walk all three dogs. Walking S second would split the R—T block. 1. Identify all of the blocked elements. 2. Determine the various places within the game where the block(s) can be placed. 3. Look for any slots where placing a single, unblocked element would split the block (i.e., make it impossible to place the blocked elements anywhere). 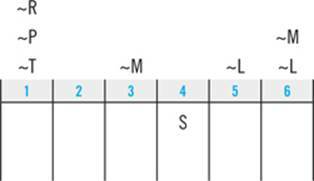 The blocks take up four slots, and there are only three slots to the left of S. So you know that one of the blocks must be in 5 and 6, and the other block must be somewhere in the first three slots. If you found it difficult to follow the reasoning that led to that deduction, don’t worry. Block-splitting deductions are the most difficult kind of deduction to make. It also gets easier to make them the more you practice working games. 1. Answer the Complete and Accurate List question. 2. Answer questions that give you more information to work with. 3. Answer the remaining questions. Complete and Accurate List Questions. The first question associated with your game about Emily walking the dogs is a Complete and Accurate List question. Complete and Accurate List questions ask, “Which of the following answer choices is an acceptable way to fill in every slot in this game?” These are by far the easiest kind of question you’ll see on the Logic Games section. If a game has one (and most games do), you should always work it first. How can you identify a Complete and Accurate List question? It will ask you to pick an arrangement that complies with all the clues, and it will always be the first question associated with the game. If a game has a Complete and Accurate List question, it will always be the first question. To answer a Complete and Accurate List question, take each clue and scan the answer choices looking for one that violates the rule that clue establishes. 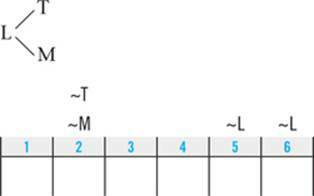 Your first clue tells you that L must come before T. Scanning the answer choices, T is listed before L in answer choice C, so you can eliminate that choice. Answer B violates clue 2, answer E violates clue 3, and answer D violates clue 4, so the correct choice for question 1 is answer A. Questions That Give You More Information. Information is the coin of the realm in the Logic Games section. The more you know about where the elements must, can, or cannot go, the easier it is to work with the game. For that reason, questions that contain new information are generally easier and less time-consuming to work than questions that require you to work only with the information given in the setup. Questions that begin with if typically give you additional information to work with. In this game, questions 3 and 6 are examples of this kind of question: each of them instructs you to assume an additional fact that further limits the ways in which Emily can walk the dogs. Since Emily must walk T second, you’ll immediately look down to the answer choices to see if that’s listed as one of the answer choices. As it turns out, it’s not, but if it had been, you could have selected it and moved on without doing any more work. Your goal on the Logic Games section is to do exactly as much work as you have to to get the right answer, and no more. Each time you place an element, check the answer choices to see if you’ve got the answer. Just by virtue of knowing that R comes third, you’re able to completely fill in the game. As the diagram illustrates, the correct choice for question 3 is answer B: Emily must walk the Poodle sixth. Pay close attention to language. What exactly is the question asking you to determine? Question 3 asks what must be true; question 6 asks what could be false. Another question may ask you what must be false or what could be true. It is crucial that you carefully note what the question is asking, and to keep it at the forefront of your mind as you work. Both must-be-true and could-be-false questions require you to determine what must be true. As it turns out, questions 3 and 6 are mirror images of each other: anything that must be true cannot be false. On a must-be-true question, you diagram the new information, definitively place as many other elements as possible, and pick an answer choice that matches what you’ve diagrammed. On a could-be-false question, the first two steps are the same, but instead of selecting the answer that matches your diagram, you eliminate it as an incorrect choice. It cannot be false (or in other words, it must be true). 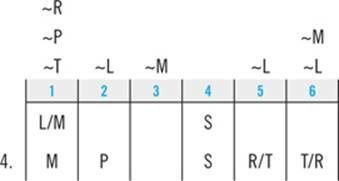 That tells you that L must come before both P and S, so you can eliminate answer choices A and E.
Finally, the third clue tells you that R and T must appear consecutively, so they go in slots 5 and 6. 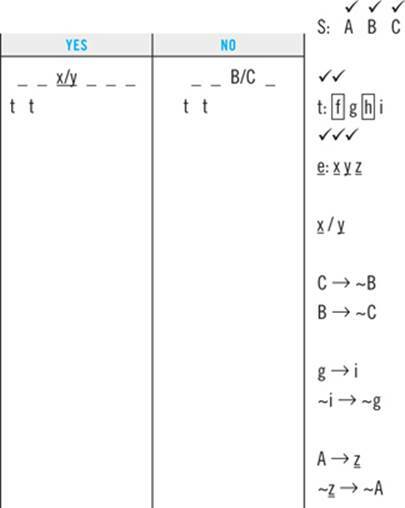 You don’t know what order R and T appear in, so you’ll place them using the “either/or” notation. That tells you that S must come before both T and R, which eliminates answers B and D. That leaves you with answer C: “Emily walks the Retriever after she walks the Terrier.” Not necessarily! Emily could walk the Terrier after the Retriever, as your diagram clearly shows. Therefore, answer C could be false, so it is the right answer. Again, carefully read the language of the question and always keep in mind what the question is asking you to determine. For question 6, if you thought you were looking for an answer that must be false instead of one that could be false, you would definitely waste a lot of time on a wild goose chase. 1. Can you answer this question using the clues and your deductions? 2. Can you answer this question using work you did on previous questions? 3. Can you answer this question using the process of elimination? Each of the three remaining questions illustrates one step in that process. Question 2 simply asks you to pick an answer choice that must be false based only on the information in the setup and the clues. The first step on a question that does not give you any new information is to look for the answer in your deductions. The correct answer to a question like this one is never merely a restatement of one of the clues. You might be able to use the clues to eliminate some incorrect answer choices, but arriving at the correct answer will always require you to make some kind of deduction. The best place to start is with the deductions you already made. Here, that’s all it takes. You already deduced that M can never be in slot 3. That deduction makes answer C the correct choice. Question 4 asks which of its answer choices must be false. On must-be-false questions, you can eliminate any answer choice that could be true. Therefore, your first step is to check to see if any of the answer choices match up with any of your deductions to create a legal arrangement of the elements. Once again, you’re in luck. Your block-splitting deduction tells you that L can’t be second, so it must be false. Therefore, answer B is the correct choice. But you noted above that block-splitting deductions are the most difficult kind of deduction to make. What would you do if you hadn’t made the block-splitting deduction? In that case, you would use the second tactic for approaching questions that don’t give you any new information: rely on the work you’ve done in answering previous questions. The second step on a question that does not give you any new information is to use your work on previous questions to select or eliminate answer choices. In the course of diagramming your answers to questions 3 and 6, you’ve already generated several examples of ways in which all six of the elements in the game could legally be placed. Accordingly, if your answers to those questions demonstrate that one or more of the answer choices to question 4 could be true, you can eliminate those choices. Using this tactic, you can eliminate answer choices D and E based on your answer to question 3 and answer choice C based on your answer to question 6. All that’s left is to pick between answer A and answer B. Your work on previous questions does not enable you to eliminate either choice, so you’ll have to turn to your third and final tactic for these kinds of questions: using the process of elimination. There are only two choices left, so you can just pick one and diagram it. If it must be false, you’ve got your answer. 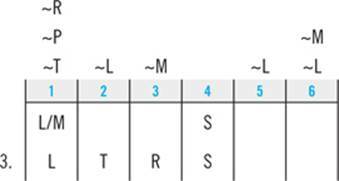 Having L in slot 3 and T in slot 5 or slot 6 satisfies the first clue, so this is a legal arrangement. Since it could be true that Emily walks M first, you can eliminate answer choice A, leaving answer B as the correct answer to question 4. Your work on question 4 highlights two things. On the one hand, it is extremely helpful to take the time up front to Make deductions. On the other hand, if you overlook a deduction, it’s not the end of the world. You can still arrive at the correct answer to a question; it’s just going to take you longer. Finally, turn to question 5. Don’t let the wording of the question confuse you; this is not the kind of question you should always work first. Not only is it not the first question associated with the game, but it asks you only about one element instead of every element in the game. Here, you’re looking for a list of the slots where R could appear that is both accurate (no wrong answers included) and complete (no right answers excluded). The steps to working this question are the same. First you turn to your deductions. You know that R can’t go first, so you can eliminate choice E as inaccurate. Your work on question 3 tells you that R can go third, so answer A is an incomplete list. Your work on questions 4 and 6 tells you that R can go sixth, so you can also eliminate answer B as incomplete. The only choices left are answers C and D, and you can’t eliminate either one based on your answers to other questions, so you’ll have to use the process of elimination. Since the only difference between those two answers is whether R can go second, you’ll plug that into your diagram and see if you can make it work. And you can: the third clue places T in slot 3; the second clue places M and P in 5 and 6; and the first clue places L in slot 1. Since R can appear in slot 2, answer C is an incomplete list. Accordingly, choice D is the correct answer to question 5. The game that you’ve just worked through is a relatively straightforward example of a one-tiered ordering game. There are many different ways the test writers can increase the difficulty level of one-tiered ordering games. By far the most common technique they use is giving you clues that are difficult to understand, difficult to symbolize, and difficult to work with. These symbolization drills are designed to introduce some of those more difficult clue types. Instructions: Below are examples of clues applied to the setup of the sample game that might appear in one-tiered ordering games. Use the “what does it look like?” principle to symbolize each of these clues (remember you can input some clues directly into your diagram). Also make a note of any can’t-be-first-or-last deductions. Answers appear on the following page. 1. Emily cannot walk the Terrier second. 2. Emily must walk the Labrador before she walks both the Mutt and the Retriever. 3. Emily must walk either the Schnauzer or the Poodle immediately before she walks the Mutt. 4. Emily must walk the Labrador before she walks the Terrier but after she walks the Poodle. 5. The Poodle must be one of the last three dogs Emily walks. 6. Emily must walk exactly two dogs in between the Mutt and the Retriever. 7. Emily must walk at least two dogs in between the Mutt and the Retriever. 8. Emily walks the Terrier either at some time before she walks the Labrador or at some time after she walks the Poodle, but not both. 9. Either Emily walks the Poodle before both the Retriever and the Mutt, or she walks both the Retriever and the Mutt before the Poodle. 10. Emily walks the Terrier before the Mutt, or else she walks the Terrier before the Labrador, but not both. Note that this clue does not support any can’t-be-first-or-last deductions. As noted at the beginning of the chapter, there are only two tasks the Logic Games section will ask you to perform: ordering and grouping. Case 1 introduced you to ordering games. Before you can turn to grouping games, however, you need to take a moment to learn how to identify and work with a particular type of clue. The purpose of this case is to introduce you to conditional statements. Working with conditional statements is essential to success on the Logic Games section. It is guaranteed that on test day you will have to symbolize and work with multiple clues that are conditional statements. In recent years, every single grouping game on the LSAT has had at least one conditional-statement clue. Many ordering games employ them as well. This case will proceed in three parts. First, we’ll discuss what a conditional statement is, how to symbolize a basic conditional statement, and how to make the deduction that every conditional statement supports. Next, we’ll deal with translating and symbolizing more complex conditional statements. Last, you’ll have a chance to practice these skills with a series of drills. A conditional statement is an “if–then” statement. For example, “If something is an apple, then it is a fruit” is a conditional statement. We’ll call the portion of the statement that follows the “if” the condition, and the portion that follows the “then” we’ll label the consequence. 1. Abbreviate the elements that make up the statement. 2. Symbolize the statement using an arrow. 3. Symbolize the statement’s contrapositive. Third, you’ll make the standard deduction that follows from every conditional statement. That deduction is known as the contrapositive. If something is an apple, then it must be a fruit. Therefore, if something is not a fruit, then it cannot be an apple. A conditional statement and its contrapositive are logically equivalent to one another: when you know a conditional statement is true, you can be certain that its contrapositive is also true. 1. Flip sides. Take the element before the arrow and move it after the arrow. Take the element after the arrow and move it before the arrow. 2. Flip signs. Take any element that is positive and negate it. Take any element that is negative and make it positive. 1. Something is an apple? 2. Something is not an apple? 3. Something is a fruit? 4. Something is not a fruit? Again, start in plain English. 1. If something is an apple, then it must be a fruit. 2. If something is not an apple, does it follow that it is not a fruit? No. The thing could be an orange or a pear. 3. If you know that something is a fruit, does it follow that it must be an apple? No. Again, it could be another type of fruit. 4. If something is not a fruit, you can be sure that it is not an apple. Conditional statements are based on their conditions. The statement only tells you something if the condition is satisfied. If the condition is not satisfied, the statement tells you nothing. Always follow the arrow when working with conditional statements. Understanding this distinction is critical to success on the Logic Games section. The first half of a conditional statement can be false, and the second half can still be true. Here’s an easy way to remember this rule: Follow the arrow. If you know A, the arrow points you to F. If you know ~F, the arrow points you to ~A. But if you know F or ~A, the conditional statement tells you nothing; you’re on the wrong side of the arrow. As long as you never go against the arrow, you won’t misinterpret a conditional statement. Statements in the form of “If A, then B” are the simplest kind of conditional statement. But the Logic Games section also employs conditional statements in more complicated forms. Fortunately, you can use a standard set of steps to symbolize these more complicated conditionals and accurately state their contrapositives. 1. Flip sides. This is the same as before: take the elements before the arrow and move them after the arrow, and vice versa. 2. Flip signs. This is also the same as before. Flip all negatives into positives, and negate anything that is positive. When symbolizing a contrapositive, everything flips: sides, signs, and connectors. The following list offers ways each of these statements can be symbolized using the standard → sign for conditionals. Symbolizing “only if” statements can be tricky. In a standard “if–then” statement, whatever comes after “if” is placed in front of the arrow. By contrast, when the clue uses “only if” language, whatever comes after the “only if” is placed behind the arrow. 1. Take what follows “unless” and make it the back half of your symbolization. 2. Take what comes before the “unless,” negate it, and make it the front half of your symbolization. These two are fairly straightforward. The trick is recognizing that all-or-nothing statements like these are actually conditional statements. This is probably the trickiest type of conditional statement you might run across on test day. The reason it’s tricky is that it’s actually two conditional statements—(1) “B if A”; and (2) “B only if A”—disguised as one. That’s why it takes two separate symbolizations to diagram it correctly. You’ll practice working with conditional statements in grouping games in the next case. Below are examples of conditional-statement clues that might appear in one-tiered ordering games. The clues refer back to the game you worked in Case 1 in which Emily walked the dogs. For each of these questions, symbolize the clue and symbolize the contrapositive. Answers follow. 1. Emily must walk the Mutt fifth if she does not walk the Terrier second. 2. Emily walks the Schnauzer second if, but only if, she walks the Retriever sixth. 3. If Emily walks the Mutt before the Poodle, then she walks the Terrier after the Labrador. 4. Emily walks the Retriever first, unless she walks the Schnauzer fifth. 5. Emily does not walk the Retriever first unless she walks the Schnauzer fifth. 6. If Emily walks the Mutt third, then she walks the Retriever immediately before she walks the Schnauzer. 7. If Emily walks the Terrier third, then she walks the Terrier before both the Labrador and the Schnauzer. 8. If Emily walks the Retriever before she walks the Mutt, then she walks the Schnauzer before both the Terrier and the Labrador. 2. Emily walks the Schnauzer second if she walks the Retriever sixth. Emily walks the Schnauzer second only if she walks the Retriever sixth. The purpose of this case is to introduce grouping games. Of the 60 games that appeared on the 15 publicly available LSATs from 2006 to 2010, 16—about 27 percent—were grouping games. That means that, on average, one of the four games in a Logic Games section is a grouping game. This case will show you how to use this same method to work grouping games. The primary difference will be in how the game is set up—and, correspondingly, what your diagram looks like. Take a moment to attempt this game before you turn to the discussion and explanation that follows. He does not invite both Angelica and Brunson. He does not invite Grant if he invites Finley. If he invites Angelica, he does not invite Isaiah. If he invites Daisuka, then he also invites Angelica. He invites either Helen or Isaiah, but he does not invite them both. If he does not invite Cathy, he invites Grant. 1. Which of the following could be the four guests whom Ralph invites to dinner? 2. If Ralph invites Daisuka, then which of the following could be true? (B) He does not invite Helen. (C) He also invites Cathy. (D) He does not invite Angelica. (E) He also invites Finley. 3. If Ralph invites Brunson and Helen, then which of the following guests must he also invite? 4. Ralph could invite either Angelica or Brunson if he also invites which of the following pairs of guests? 5. If Ralph invites Cathy, which of the following guests, if invited, would result in the guest list for the party being completely determined? Again, to determine what type of game you’re dealing with, you look to the language in the setup and the language in the clues. This game asks you to sort the elements into two lists: those who are invited to the dinner party, and those who are not. That makes this a grouping game. The setup of a grouping game will contain language that instructs you to “select,” “choose,” or “assign” certain elements “from” or “among” a list to a particular group, bin, or team. The setup may introduce the clues with language telling you that the clues limit the composition of each group, the formation of each team, or the assignment or selection of the elements. In the clues, look for language that keeps elements together or forces them apart by assigning them to the same or a different group or team. Similarly, the clue might tell you that a certain team or group cannot have a particular element, must have a particular element, must have both of two elements, or must have one or the other but not both of two elements. In addition, most grouping games utilize conditional clues that tell you what happens if a certain element is included, excluded, selected, omitted, on, off, in, or out. Grouping games contain language in the setup telling you to select, choose, or assign elements to teams, groups, or bins. This game, with Ralph hosting a dinner party, is the most typical type of LSAT grouping game in two respects. First, it has only two groups. You’ll also encounter grouping games with more groups, but two-group games are much more common. Second, the “people who are not invited” is a second, equally important group. That’s typical of two-group grouping games on the LSAT: the game tells you only that certain elements must be invited, selected, chosen, assigned, or taken. It’s left to you to create a second group. Create a diagram that captures the logical relationship between the game’s elements. What does this game look like? Recall the general principles of symbolization discussed in Case 1. You should symbolize the clues so that they look on the page as they’ll look in the diagram. And whenever possible, symbolize clues directly into the diagram. That placeholder tells you that one slot in the “no” is always spoken for by either A or B. List those clues out to the side of your diagram. Any time you symbolize a conditional clue, you should also immediately symbolize its contrapositive. Second, this clue tells you both that if Ralph invites H, he can’t invite I, and also that if he doesn’t invite H, then he must invite I. You should also symbolize each of those conditional statements along with its contrapositive. Since the elements don’t appear in any order, you won’t be able to make the first type of deduction. That takes you to repeated-element deductions. This game presents an opportunity to make a particular kind of repeated-element deduction, which we’ll call conditional-combination deductions. 1. Look for an element that appears in the front half of one conditional clue and in the back half of another. In other words, the same element needs to be on the left side of one arrow and the right side of a different arrow. To make conditional-combination deductions, look for an element that is on the left side of one arrow and the right side of another. Look at clues 6 and 2. G appears on the right side of the arrow in clue 6 (~C → G), and it appears on the left side of the arrow in the contrapositive of clue 2 (G → ~F). Therefore, you can combine those two statements to make the following deduction: ~C → G & ~F. You can add that deduction to the bottom of your list of clues. You can make a similar deduction by combining clues 1 and 4. Take a moment to make it yourself. The net result of B → ~A and ~A → ~D is B → ~A & ~D. This game will support one final conditional-combination deduction, and it’s a big one: four separate clues are involved. See if you can identify which ones they are. Remember, find an element that appears on the right side of one arrow and the left side of another. Continue to repeat the process until no more combinations are available. In a two-group grouping game like this, this is an immensely valuable deduction. If D is in the “yes” group, it dramatically constrains the game; you automatically know what happens with five out of the eight elements. That’s a lot of information to keep track of; this is one of the ways the LSAT’s writers can increase the difficulty level of a game. No other conditional-combination deductions are available, so look now for down-to-two deductions. Two-group grouping games like this one frequently support a particular type of down-to-two deduction. Importantly, there’s no placeholder in the “yes” group. It would be perfectly consistent with clue 2 for both F and G to be in the “no” group. There is one other clue in this game that will support the same kind of deduction. Take a moment to see if you can identify it. There are no other down-to-two deductions available, and there are no block clues in this game, so you won’t be able to make any block-splitting deductions. That means you’re ready to turn to the questions. The Complete-and-Accurate-List Question. Question 1 is a Complete and Accurate List question, although it might not look like one at first. Each answer choice is a complete list of the members of a “yes” group; correspondingly, each “no” group is made up of the four elements not listed. To answer this question, work with each of the clues one at a time. Pick a clue, then scan the answers looking for a choice that violates the rule that clue establishes. Repeat this process with all of the clues. Here, answer A violates clue 1, answer D violates clue 2, none of the answers violates clue 3, answer E violates clue 4, none of the answers violates clue 5, and answer C violates clue 6. The down-to-two deduction you made based on clue 6 is helpful here; it makes it much easier to recognize that answer C must be eliminated because it contains neither Grant nor Cathy. As a result, the correct choice is answer B. Questions That Give You More Information. Next up is question 2, which instructs you to plug D into the “yes” group and asks what could be true a result. (A) He also invites Brunson. Just by plugging in that deduction, you learn that answer choices A, B, and D can be eliminated; they all must be false. Since F must be a “no,” answer E must be false. As the diagram illustrates, the correct answer to question 2 is answer C: it could be true that Ralph invites Cathy. Question 3 asks who must also be invited if Brunson and Helen are invited. That allows you to eliminate answer choice E, but that’s as far as you can go, and you don’t yet have enough information to answer the question. What next? Unable to fill in the rest of your diagram, you have to turn to the process of elimination. 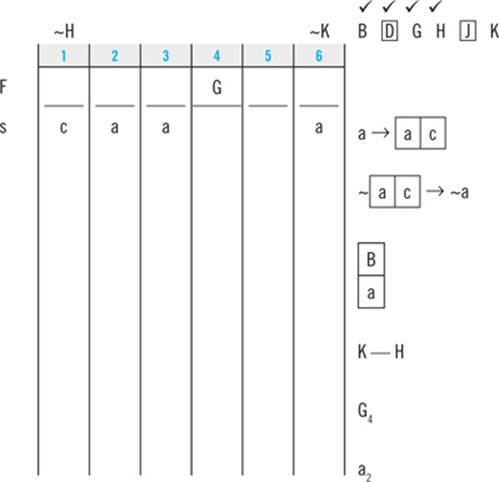 But that doesn’t mean you should just grab the first answer choice you see and plug it into your diagram. That approach is time-consuming; you could end up having to diagram three or four possibilities. There’s a smarter way to eliminate answer choices. It’s based on the down-to-two concept you’re familiar with from making deductions. When you have to use the process of elimination, look for a slot in your diagram that is restricted to two possibilities. The down-to-two strategy for the process of elimination works like this: If there’s any slot in your diagram that you know is restricted to two possibilities, diagram both of them. Once you do, you’ll know you’ve exhausted all of the game’s possible arrangements. That will allow you to determine what must be or what could be true. Here, you know that the last slot in the “no” group must be occupied by either F or G. So you can draw two scenarios—one where F is a “no,” and one where G is a “no”—and be certain you’ve covered the full universe of possibilities. This arrangement, too, is consistent with all the clues. This allows you to arrive at answer A as the correct answer to question 3: Ralph could invite either Finley or Grant, but he only must invite Cathy. The last question that gives you new information is question 5. This is one of the more difficult question types you’ll encounter on the Logic Games section. You want to look for answer choices that contain elements that are heavily restricted. The more information you have about an element, the more likely it is that placing that element will completely determine the game. On questions that ask which element must be placed to completely determine the game, start with the elements about which you have the most information. D → A, ~B, ~I, & H.
In other words, if D is a “yes,” A and H must also be “yeses.” The question tells you that C also must be a “yes”—that makes four elements in the “yes” group, which completely determines the game. Consequently, the correct answer to question 5 is answer C.
If you hadn’t been able to zero in on D based on your deductions, you would have worked through the answer choices one at a time. If, after plugging in the answer, any slot in the game is not definitively filled, you would eliminate that choice and move on. There’s no faster or smarter way to tackle these kinds of questions. The Remaining Questions. That brings you to question 4, the only question associated with this game that does not give you any new information. 3. Can you answer this question by plugging the answer choices into your diagram? Question 4 asks which two guests can be invited so that Ralph would still be free to invite either Angelica or Brunson. In other words, what pair of invitees makes A and B interchangeable? First, work with the clues and your deductions. The correct answer will not contain any element that, when placed in the “yes” group, requires either A or B to be invited. Similarly, the correct answer will not contain any element that, when placed in the “yes” group, prohibits either A or B from being invited. 1. Find either A, ~A, B, or ~B as a consequence, behind the arrow. 2. Eliminate the element that is the condition. Looking over your clues, you first come across the contrapositive of clue 3: I → ~A. If I is invited, Ralph is prohibited from inviting A. That allows you to eliminate answer choices B and C. Next up is clue 4: D → A. Since inviting D obligates Ralph to also invite A, you can eliminate answer choices A and D. By the process of elimination, you know that the correct answer must be answer choice E.
The grouping game you just finished was not particularly easy. The fact that every single clue was a conditional statement added a substantial measure of difficulty. On the other hand, the fact that the game specified that each group had exactly four members made working it a lot easier. There are a variety of ways that grouping games can be made more difficult. The following page contains two setup drills that are designed to introduce you to some of the variants on grouping games you might encounter on test day. Each drill contains the setup and the clues of a grouping game, but no questions. For each drill, symbolize the clues, begin your diagram, and make deductions. Answers and comments follow the games. On each round, she visits either C or D.
She visits both C and E on exactly one of her rounds. She visits B on exactly two of her rounds. She does not visit A on a round unless she is not visiting either E or D.
He must display at least one of X or Y. He displays exactly two trucks. He does not display B if he displays C.
If he displays I, he also displays G.
If he displays A, he also displays Z. 1. Identifying the game type. At first glance, you might mistakenly identify this as an ordering game, since the doctor is visiting patients on three sequential rounds. It’s not until you read the clues (which have no “before/after” or “earlier/later” language) that it becomes clear this is a grouping game. 2. Repeated elements. Clue 3 specifies that B appears exactly twice, and the setup and the other clues leave open the possibility that the other elements also could appear two or maybe three times. That adds a degree of difficulty to the game. 3. Variable number of elements per group. The setup tells you that each group must have at least two elements, but it gives you no guidance on what the upper limit to the groups’ size is. Based on clue 4, you know that no group will have all five elements, but that’s all you know. The lack of a fixed number of elements per group also makes this game more difficult. 4. Clues that are hard to symbolize. Clues 1 and 4 are pretty standard, but clues 2 and 3 are not. You just have to find a way to notate the information they present in a way that makes sense to you (here, “exactly” has been abbreviated as “ex.”). 1. Multiple element types. This is a common way the LSAT makes grouping games more difficult: creating multiple types, kinds, or categories of elements. When the game does that, your symbolizations should visually distinguish between the different kinds of elements: here, the diagram shows upper-case, lower-case, and underlined letters to distinguish the three kinds of automobile. 2. Sheer size. Increasing the number of elements involved in the game makes the game more difficult. It’s harder to keep track of 10 elements than it is to keep track of 6. 3. Identical elements. Two elements in this game—f and h—are free agents. Other than the fact that they are trucks, the game places no restrictions on them. They are functionally identical to each other; anything one can do, the other can do, and vice versa. That’s an easy thing to lose sight of while working a game; here, those two elements are circled as a reminder. This case introduces the third major game type you’ll encounter on the Logic Games section. Games like these require you to group the elements into teams that are composed of exactly two elements. They also usually ask you to put the elements and teams in a particular order. In other words, they typically involve both the ordering task and the grouping task. We’ll refer to these games as two-tiered ordering games. Fourteen of the last sixty published games—that’s 23 percent, almost one out of every four—have been two-tiered ordering games. You’re almost as likely to see one of these on test day as you are to see a grouping game. As the name suggests, the best way to approach these games is to use a diagram that is derived from and very similar to the one you used to approach a one-tiered ordering game. This case introduces that setup and some of the distinctive kinds of clues two-tiered ordering games frequently utilize. A sample two-tiered ordering game appears follows. This game has an abbreviated set of questions because you’ll use the same approach to working questions on two-tiered ordering games that you use on other types of games. The few included here are designed to help familiarize you with working with this kind of diagram. Take a moment to try to work this game on your own using the familiar six-step approach before you turn to the explanation. She cannot take Macroeconomics and Rhetoric on the same day. She must take Macroeconomics and Sociology on consecutive days. She must take Philosophy on a later day than Oceanography. She must take Linguistics sometime after she takes Sociology. She must take Oceanography at 11:00 a.m.
1. If Trudy takes Sociology at 11:00 a.m. on Wednesday, which one of the following must be true? (A) She takes Macroeconomics at 11:00 a.m. on Tuesday. (B) She takes Oceanography at 11:00 a.m. on Tuesday. (C) She takes Philosophy at 3:00 p.m. on Tuesday. (D) She takes Linguistics at 3:00 p.m. on Monday. (E) She takes Rhetoric at 3:00 p.m. on Monday. 2. Which of the following cannot be the pair of classes Trudy takes at 11:00 a.m. and 3:00 p.m. Tuesday, respectively? 3. If Trudy takes both Macroeconomics and Philosophy at 11:00 a.m., which of the following must be true? (A) She takes Philosophy on Tuesday. (B) She takes Macroeconomics on Tuesday. (C) She takes Linguistics on Wednesday. (D) She takes Rhetoric on Monday. (E) She takes Oceanography on Monday. 1. The setup and the clues will use both grouping language and ordering language. 2. The game will have you assign exactly two elements to each group. 3. The two slots in each group will be specified. For example, the setup of this game has a clear ordering component. Trudy is taking classes in sequential order: first Monday, then Tuesday, then Wednesday, and each day her 11:00 a.m. class comes before her 3:00 p.m. class. And the clues are rife with ordering language: some classes must be taken on a later day than, consecutive days with, or sometime before other classes. At the same time, the setup of this game tells you that you’re assigning elements (from a list of classes) to a particular group (a day of the week). And the first clue tells you that M and R can’t be assigned to the same day. Both of those instructions utilize grouping language. The second hallmark is also clearly present: Trudy “takes exactly two classes per day.” That type of instruction is a strong indicator that this is a two-tiered ordering game. 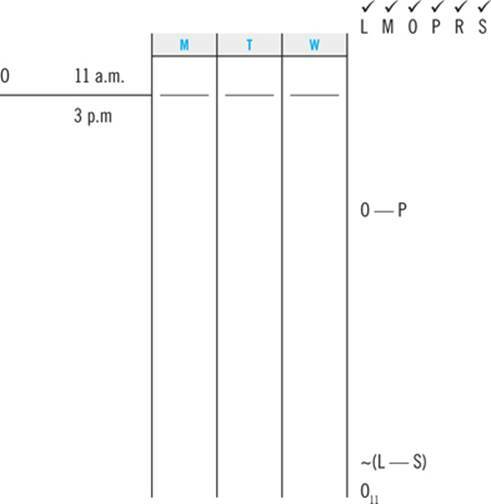 Finally, not only does each group (day of the week) have two members, but the slots into which those members will be placed are specified: one slot is “11:00 a.m.” and the other is “3:00 p.m.” And the slots are not interchangeable, as the fifth clue makes abundantly clear. 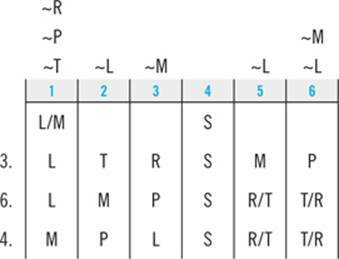 This feature of the game—two-member groups in which each member is assigned a specified slot—is also a telltale sign of a two-tiered ordering game. Not all two-tiered ordering games will have all three of these hallmarks. Whenever you see a game that has two of the three, you should use the two-tiered ordering setup. One final point about identifying two-tiered ordering games. Not all two-tiered ordering games will exhibit all three of these telltale features. But as long as a game exhibits two of these three features, you should still use the two-tiered ordering setup. For example, some games might have you assign elements into two-member groups, but the slots in the group will be interchangeable. Others will have you assign exactly two elements to each group, and the slots in the group will be specified, but there will be no ordering component to the game. 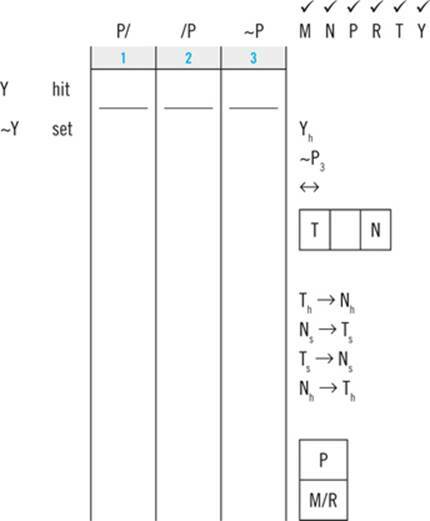 You should still use the diagram introduced in this case to set up those kinds of games. Yes, you read that right: there are situations in which you should use the two-tiered ordering setup even when the game does not involve ordering. If the game tells you that each group has two slots, and each slot is specified, the approach you’re learning in this game is the best one to use. As we’ll see when we turn to symbolizing the clues, this diagram allows you to accurately capture several different kinds of logical relationships between the elements. What would this clue look like? If Trudy took M and R on the same day, they would appear on top of each other in the diagram. This clue tells you that can’t happen, so you’ll add the “not” sign. 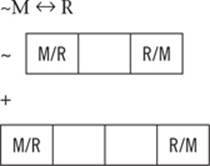 And finally, you’ll use the switching arrow to convey that the clue means M and R can’t be on the same day. Note that this does not mean that M can’t be at 11:00 and R at 3:00 (or vice versa) on any given day. This type of clue also should be familiar to you from Case 1. This time, you can use the same symbolization here that you used there, because it is an accurate representation of how this clue will look in the diagram. Careful—this clue is something of a trap. Take a moment to compare it to clue 3. Clue 4 permits an arrangement between L and S that clue 3 forbids between P and O. Do you see it? This clue would allow Trudy to take Sociology at 11:00 a.m. on Wednesday and Linguistics at 3:00 p.m. the same day. But clue 3 would prohibit her from taking O and P in those same time slots. You can add both of those to your list. This step is the same from game to game: translate your symbolizations into English, then make sure that your translations match up with the language of each clue. Do this fully and carefully; there is no more valuable investment of time on the Logic Games section. You don’t have any other before-and-after type clues, so turn to repeated-element deductions. Both M and S appear in multiple clues. But there’s no way to combine the clues. Why not? Because in each case one clue tells you what the element must do, while the other tells you what the element must not do. 1. Identify the blocked elements. 2. 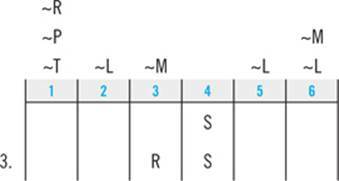 Determine where the block(s) can be placed. 3. Look for any slots where placing a single, unblocked element would split the block. Your only block clue here is clue 3: M and S must appear on consecutive days. How could you satisfy that clue? You could place one on Monday and one on Tuesday, or one on Tuesday and one on Wednesday. And that points the way to a block-splitting deduction: no matter what, one of either M or S must be on Tuesday: if, for example, you put both O and R on Tuesday, there would no way to fill in the rest of the game that was consistent with clue 3. And now you’re ready to tackle the questions. As noted above, this game has an abbreviated set of questions. Since there is no Complete and Accurate List question, turn directly to the questions that give you new information. We start with question 1. 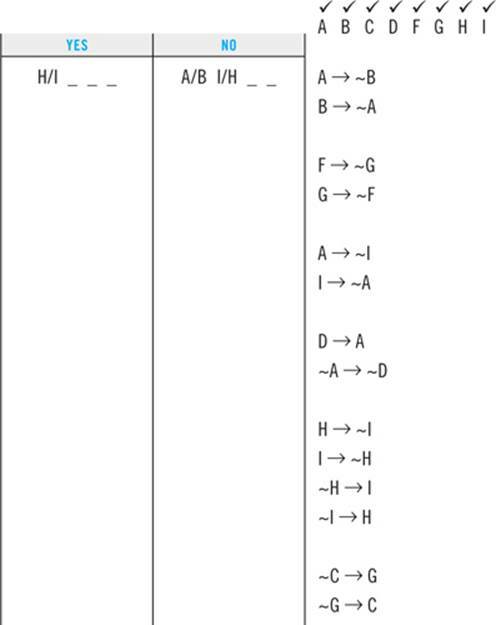 As the diagram illustrates, the correct answer to question 1 is answer E. Answers B and D must be false, while answers A and C could be, but need not, be true. Now we’ll look at question 3. Clue 5 tells you that O also must be at 11:00 a.m., so you now know that M, P, and O must occupy the three morning slots, while S, L, and R must be in the afternoon. What next? Although this question gives you new information, it may not be immediately apparent how to plug this new information into the diagram. In this situation, turn to the down-to-two principle and look for an element or slot in the diagram that has only two possibilities. Once you diagram them both, you’ll know you’ve covered everything. You know that O can go in only one of two slots, thanks to clue 2. That gives you a good place to start on this question: if you plug O into Monday and Tuesday at 11:00 a.m., you’ll have covered all your bases. Do you see the problem with this arrangement? Clue 1 prohibits M and R from being on the same day. Therefore, O can’t be on Tuesday. Ordinarily the next step would be to plug O into the Monday slot and continue diagramming possibilities. Fortunately, however, placing O on Tuesday allows you to identify answer choice E as the correct answer, so there’s no need to work any further. It must be true that O is in the 11:00 a.m. Monday slot. Now turn to question 2. On questions that give you no new information, your first step is to attempt to use your clues and deductions to eliminate or select answer choices. Here, that’s as far as you have to go. Your block-splitting deduction tells you that Trudy must take either M or S on Tuesday. Answers A and B contain S, while answers D and E contain M. Since putting both R and L on Tuesday would split the M–S block, the correct answer to question 2 is choice C.
Recall from our discussion of step 1 that two-tiered ordering games have three hallmarks, the presence of any two of which is enough to signal that you should set up the game using the diagram you learned in this case. One of the main challenges that two-tiered ordering games present is the fact that they can sometimes be difficult to identify. Following are two setup drills of games that are harder to identify as two-tiered ordering games. Each drill contains the setup and the clues of a two-tiered ordering game, but no questions. for each drill, symbolize the clues, begin your diagram, and make deductions. Answers and comments appear after the games. Pay close attention to the language in the setup and the clues; see if you can pinpoint exactly what makes each game a two-tiered ordering game. Priscilla does not practice on court three. Tanya and Nancy play the same position. Priscilla practices on the same court as either Maria or Rebecca. Each file from an active case has a file from a closed case directly behind it. B is an active case. K is somewhere in front of H.
G is the fourth file in the cabinet. Comment. This game has two of the three hallmarks of a two-tiered ordering game—you are assigning exactly two elements to each group, and the slots in the groups are specified—despite the fact that there is no ordering component to this game. The benefit of using this setup for a game like this is that it allows you to use blocks in diagramming both clues 3 and 4. Comments. Two points will help you solve this game. 1. Correctly identifying the game type: This is a fairly common type of two-tiered ordering game: you’re assigning elements to slots, and each of those elements has one of two particular characteristics. When you see a game like this, this is the best setup: the element in the top tier, and the characteristic in the bottom tier. 2. Making deductions based on clue 1: Two-tiered ordering games like this one almost always have a clue similar clue 1, from which you can deduce a lot of information about the second tier of the game. It’s important that you identify that this kind of clue (1) should be diagrammed as a conditional statement, and (2) will support an “if someone must be after you, you can’t be last” deduction. This case introduces the final type of game you could encounter in the Logic Games section. Games like these are relatively rare: only 10 percent of the more recently published games have been “1-2-2 or 1-1-3?” games. When they do show up, they are usually one of the more difficult games in the section. In Case 6, which will discuss strategies for working the Logic Games section as a whole, we’ll talk about ranking games by order of difficulty and working your way through the section from easiest to hardest. One of the best reasons to learn about these “1-2-2 or 1-1-3?” games is to learn how to identify them and postpone working on them until you’ve already completed the easier games. So what exactly is a “1-2-2 or 1-1-3?” game? Like two-tiered ordering games, these games are hybrid games that involve both the ordering task and the grouping task. 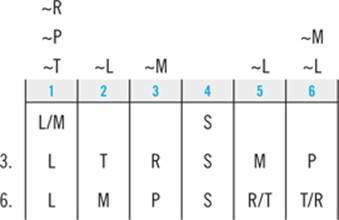 Unlike two-tiered ordering games, they do not assign a fixed number of slots to each group. The defining feature of a “1-2-2 or 1-1-3?” game is that instead of dictating the number of elements assigned to each group in the setup, it requires you to determine this as part of the game. The bad news about these games is that the number of elements assigned to each group can vary from question to question. That variability adds difficulty to these games. The good news is that there is always a very small number of possibilities for how many elements there might be in each group. Typically, there are only two possible ways to distribute the elements among the groups. Hence the name we’re using to describe these games. For example, a game might list five elements, create three groups, and tell you nothing more than that each group contains at least one element. In this hypothetical game, there are only two ways to distribute the elements among the groups: 1, 2, and 2; or 1, 1, and 3. Taking the time up front to identify the different possible distributions of elements among the groups is the key to conquering these games. A sample game of this type follows. Like the game in Case 4, this game contains only a few sample questions. Try to work this game on your own before you turn to the explanation. As you work it on your own, focus on trying to identify how many ways the elements can be distributed among the groups. He delivers Eun’s bag at the same time he delivers either Anand’s bag or Blake’s bag, but not both. He delivers Francisco’s bag before he delivers Eun’s bag. He delivers Deanna’s bag before he delivers Blake’s bag. He does not deliver Carmina’s bag before he delivers Eun’s bag. 1. If the bellman delivers Anand’s and Carmina’s bags and no others on his third trip, then which of the following must be true? (A) He delivers exactly one bag on his first trip. (B) He delivers exactly one bag on his second trip. (C) He delivers exactly two bags on his second trip. (D) He delivers exactly three bags on his first trip. (E) He delivers exactly three bags on his second trip. 2. If the bellman delivers Anand’s bag on his first trip, which of the following must be true? (A) He delivers Deanna’s bag on his first trip. (B) He delivers Deanna’s bag on his second trip. (C) He delivers Carmina’s bag on his third trip. (D) He delivers Eun’s bag on his third trip. (E) He delivers Francisco’s bag on his second trip. 3. If Blake’s is the only bag the bellman delivers on one of his trips, which of the following could be true? (A) He delivers Deanna’s bag on his third trip. (B) He delivers Carmina’s bag on his second trip. (C) He delivers Blake’s bag on his first trip. (D) He delivers Anand’s bag on his first trip. Like a two-tiered ordering game, the setup and clues of a “1-2-2 or 1-1-3?” game will contain both ordering language and grouping language. The key difference between the two is in the number of elements that are assigned to each group, bin, or team. Instead of being fixed at exactly two, the number will vary from a required minimum of one up to a maximum of three (or—on very rare occasions—four). That combination—language that is a hybrid of ordering and grouping plus a variable number of elements per group—is the hallmark of a “1-2-2 or 1-1-3?” game. The language the game uses to convey that combination will vary. In some games—including this one—the setup will expressly instruct that “each [group] must have at least one [element], and each [group] can hold up to three [elements].” When you see that kind of language—each group contains a minimum of one and a specified maximum of three or more—you know you’re dealing with a “1-2-2 or 1-1-3?” game. Other times, however, these games are harder to identify. The setup might only specify that each group contains at least one element, leaving the maximum number of elements per group undefined. That, too, is a hallmark of a “1-2-2 or 1-1-3?” game, although it’s not always easy to spot. In fact, when a game involves both ordering and grouping, it’s very easy to make the mistake of assuming that it’s a two-tiered ordering game. Be mindful of this possibility. In sum, once you recognize that a game involves both ordering and grouping, your next step should be to look at the number of elements assigned to each group. If it’s specified that each group must have exactly two elements, you’re dealing with a two-tiered ordering game. If the number of elements in each group can vary, you’re dealing with a “1-2-2 or 1-1-3?” game. Sometimes you’ll know the number of elements can vary because the game tells you that the maximum per group is more than two. Other times the game will not specify any maximum. When a game has both ordering and grouping components and the setup does not explicitly state that each group must have exactly two elements, you’re dealing with a “1-2-2 or 1-1-3?” game. This game also involves ordering, though, so you might be wondering why you wouldn’t use a tiered ordering diagram similar to the one you used in Case 4 when Trudy picked her course schedule. The reason is that a tiered ordering setup can quickly become unwieldy and difficult to work with on a “1-2-2 or 1-1-3?” game. You don’t know how many tiers to put in each group, and not every group will have the same number of tiers. The traditional grouping setup can better accommodate the flexible, variable group size in “1-2-2 or 1-1-3?” games. These clues tell you how the elements must be ordered between the groups, not within the groups. Visually, the representation of the clue is accurate, but it is slightly more susceptible to misinterpretation. Unfortunately, there’s no better way to draw the diagram and/or symbolize the clue. This is another reason why “1-2-2 or 1-1-3?” games tend to be some of the hardest games you’ll encounter in the Logic Games section. “1-2-2 or 1-1-3?” games require you to make a new kind of deduction in addition to the three standard deductions that you’ve already learned. On games like these, one of your core tasks is to determine how many different ways there are to distribute the elements among the groups. The first deduction you should make on a “1-2-2 or 1-1-3?” game—and these games will always support this kind of deduction—is to list out the different possible group-size combinations. You can call these group-size deductions. 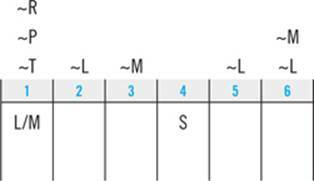 Group-size deductions are a combination of the process of elimination and counting. The most systematic way to make group-size deductions is to start small and work your way up. Try to make as many groups as possible that have only one element in them. Gradually work your way down so that only one group has only one element. Then, try to have as many as you can with only two elements in them, and then three. For example, in this game, there are three groups and six elements. Each group must contain at least one and at most three elements. So start by asking if you could possibly have two groups with exactly one element. That would force four elements into the third group, so the answer is no. What about one group with exactly one element? If you put two elements in the second group and three in the third, that works. So you know one possible arrangement: 1-2-3. If the smallest group has two elements, the distribution is even: 2-2-2. Could the smallest group have three elements? If so, two groups would each have three elements, while the third group would have none. Since the setup tells you that each group must have at least one element, there is no legal arrangement where the smallest group has three elements. That leaves only two possibilities for how the elements can be distributed among the groups: 1-2-3, or 2-2-2. That’s typical: most games of this type only allow two legal arrangements (on rare occasions there will be three possibilities). Make sure you make a note of the possible arrangements somewhere on the page. Limitations on how the elements can be distributed among the groups invariably play a large role in determining the correct answers to questions on “1-2-2 or 1-1-3?” games. Now let’s turn to the more familiar deductions. Finally, look for down-to-two deductions. With this game, this process is quick. You can see that only three of the elements can ever end up in group 1, but you can’t narrow it down any further, so turn to the questions. This game also has an abbreviated set of questions that does not include a Complete and Accurate List question, so turn directly to the questions that give you new information. Clue 1 tells you that either A or B must be with E. Since A and C are the only elements in group 3, you know that B and E must be together in one of the first two groups. Since C is in the last group, you know that clue 4 will be satisfied no matter what you do with E.
That definitively places all six elements; all six can only go in one particular group. That allows you to identify choice C as the correct answer. This question tells you that A is in group 1, and asks what must be true as a result. A appears in only one clue, clue 1: E has to be with either A or B. But you know from clue 2 that E can’t be in group 1. Thus, you know that E and B have to be together in one of the two later groups. Nothing in the question, the clues, or your deductions tells you which group E and B will be in, but that’s okay. You’ll use your down-to-two tactic and diagram both possibilities. That allows you to eliminate choices B, D, and E.
And that’s as far as you need to go to answer this question: under both scenarios, C is in group 3, and that makes choice C the correct answer to question 2. Finally, turn to question 3. This question tells you that B is alone in one of the groups and asks what could be true as a result. If B is alone, clue 1 tells you that E and A must be together. The question doesn’t specify which group B is alone in, but your deduction from clue 3 tells you that B can never be in group 1. Not only does that allow you to eliminate answer choice C, but you also once again find yourself down to two possibilities, so you can start diagramming. 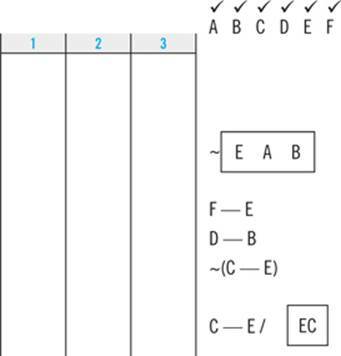 This arrangement allows you to identify choice B as the correct answer. 1. If you see a game that (1) involves ordering and grouping, and (2) does not specify that there are two elements in each group, you’re dealing with a “1-2-2 or 1-1-3?” game. 2. Every “1-2-2 or 1-1-3?” game will support a group-size deduction. 3. If you see one of these games, it’s likely to be one of the more difficult games in the section. 1. Identify the game type. What does this game look like? Have you listed out all the elements in the game? Visually, what will this clue look like when it’s placed in the diagram? When you translate your symbolization back into English, does it match the language of the clue? Can you make any repeated-element deductions using elements that appear in more than one clue? If there are multiple conditional clues, can you make any conditional-combination deductions? Can you make any down-to-two deductions? Are there any one-or-the-other clues that will allow you to use placeholders? Can you make any block-splitting deductions? 6. Answer the questions in the smartest order. (A) Answer the Complete and Accurate List question. Is this the first question associated with the game? Which clue does each answer choice violate? (B) Answer questions that give you more information. How does this new information fit into your diagram? (C) Answer the remaining questions. Can you answer this question using the clues and your deductions? Can you answer this question using work you did on previous questions? Can you answer this question using the process of elimination? Is there a place in the game that is limited to two possibilities, so that if you diagram them both you know you’ve covered all your bases? Those six steps will enable you to work any game you encounter. The final piece of the puzzle is a strategy for tackling the Logic Games section as a whole. 1. Work the games in the right order. You should work the easier games before you work the harder games. 2. Work the games at the right speed. You should work at the pace that maximizes your accuracy. Accuracy is more important than speed, even if being accurate means you don’t have time to work all of the questions. Put differently, your goal is not to answer every question. Your goal is to answer as many questions correctly as you can. And the best strategy for answering questions correctly is not to hurriedly work every single question on all four games, racing to beat the 35-minute buzzer. On the contrary, most LSAT takers are better served by slowing down and concentrating their effort on fewer questions. Consider: every Logic Games section contains four games and is 35 minutes long; most have 23 questions. Let’s say you take 32 minutes to answer the 18 questions associated with the three easiest games. Because you’re able to work carefully, you answer those questions at a 90 percent rate of accuracy. With the remaining time, you work the complete-and-accurate-list question on the final game (which, with practice, you’ll be able to answer correctly every time). You guess on the other four questions; since each question has five choices, on each question you have a 20 percent chance that your guess will be right. On average, that strategy will net you 18 correct answers: (18 × 0.9) + 1 + (4 × 0.2) = 18. Eighteen out of twenty-three is 78 percent, which will earn you a score of around 163. That’s high enough to make you competitive for admission to virtually any law school in the country. 1. Rank the games by difficulty. 2. Work the easiest game first. 3. Work the easiest questions first. 1. What type of game is it? 2. What do the clues and the setup look like? 3. What do the questions look like? What Type of Game Is It? The first thing you have to figure out is what kind of game you’re dealing with. As discussed in Case 5, if you see a “1-2-2 or 1-1-3?” game, it’s almost certainly one of the harder games in the section. Leave it for last. As for the other games, keep in mind that everyone has individual strengths and weaknesses. After you’ve practiced working Logic Games for a while, you may find that grouping games give you more trouble than ordering games, or that you tend to do well on two-tiered ordering games. Incorporate that kind of personal knowledge into your decision about which games to work first. What Do the Clues and the Setup Look Like? The test writers have a standard set of tricks they use to make each type of game more or less difficult. As you’re scanning the setup and the clues, keep an eye out for the following elements. Are the clues hard to understand, symbolize, and work with? You saw some examples of complex clues like these in the drills following Case 1 and Case 2. This is by far the most important thing to focus on when you’re assessing the difficulty of any kind of ordering game. How does the number of elements compare to the number of slots? 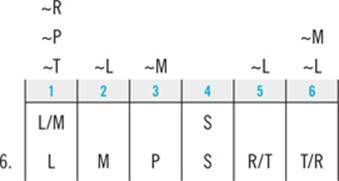 Ideally, the numbers should be the same—that is, you’re putting six elements in order from one to six. Therefore, the easiest ordering games will say that each element is used “exactly once.” If the elements must be used “at least once” (e.g., you have to use five elements to fill eight slots) that means you’re going to be repeating elements, so the game will be a little bit trickier. If the game doesn’t specify, some elements may not be used at all (e.g., you have to fill seven slots from a group of ten elements). Is the number of elements in each group variable or fixed? Games where the number of elements within each group is fixed tend to be easier. Games that say you can have “up to three” elements or “at least two” elements will be harder. Are there multiple types of elements, or are all the elements the same? It’s typically easier to work games that involve only one kind of element. Games where the elements are divided into subcategories are more difficult, such as drill 2 of the grouping games, the one with the 10 cars that were divided into three types (sedans, trucks, economy models), which then had to be grouped into six slots. How big is the game? It tends to be easier to sort 6 elements into groups than it is to sort 12 elements into groups. How many conditional clues are there? Having all conditional clues or multiple conditional clues tends to make a game more difficult. Do all of the elements have to be used? On this factor, grouping games and ordering games are similar. The easiest grouping games use each element exactly once. More difficult games allow elements to be repeated or don’t require all the elements to be used. What Do the Questions Look Like? There are three things to look for in the questions that might influence your decision about which games to work first. 1. First, how many questions give you new information? Those questions tend to be among the easiest to work. So, for example, a game with a Complete and Accurate List question, three questions that give you new information, and one other question is preferable to a game with a Complete and Accurate List question, one question that gives you new information, and three other question types, such as those that require you to rely solely on your deductions and your answers to previous questions. Which of the following, if substituted for clue 4, would have the same effect on the composition of the game? Which of the following, if known, allows the order of the elements (or the composition of the groups) to be completely determined? Each of these types of questions is difficult and time-consuming. However, that doesn’t mean that you should skip the game entirely. If the game otherwise looks good, you might work all the other questions, guess on this question, and use the time you save to work the easier questions on another game. 3. If all else fails and two games appear to be equally difficult, look to how many questions there are associated with the game. Other things being equal, a game with six questions is preferable to a game with only five. All in all, the process of ranking the games in order of difficulty should only take you 90 seconds to two minutes. That’s not a lot of time, so you’ll necessarily be making some snap judgments. It doesn’t matter if you’re slightly off and work the second easiest game before the easiest one. The most important thing is to identify the game that is likely to give you the most trouble and work it last (if at all).